So, this week my biggest goal was to get started with a workout plan. Guess what I didn’t do this week??? ARGH! I told you, the beginning is the hardest part for me. I’m REALLY terrible about not taking time for myself during the day, and by 9:00 when the kiddos go to bed, I’m exhausted! There will be no exercising for this Mama after 9:00pm. So, I’ll give this one another shot this week. Pray for me!! This week I’m going to try to really buckle down and get some things crossed off of my ridiculously long to-do list. I have a tendency to leave the really not so interesting items on my list for far too long. When in reality, if I would just make the time to do them, they’d take very little time and effort and then I could cross them off the list and say “Done” (which happens to be one of my favorite things to do). So, although my things aren’t very exciting, they are things that need to get done…and that will be my goal this week. I’m also going to start painting the kitchen this week. Check out my inspiration picture!!! I just LOVE the gray and white color scheme with the yellow accents! I am really excited to get moving on my kitchen project. But, I also know that due to time and money constraints, it’s not going to be an overnight (or even an over-month project). So, patience is going to be a big one for me here. 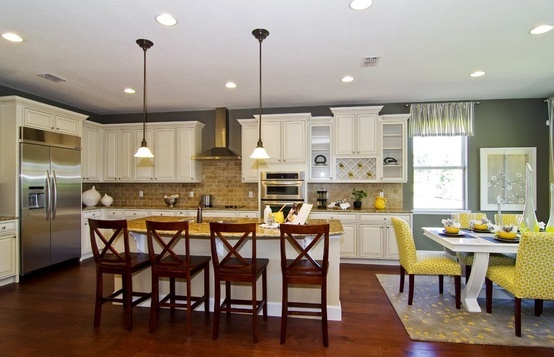 Okay, so my kitchen is nowhere near this big…..but one can dream, right?? We are still going strong with our homeschooling. The kids and I just love it. There’s something about being at home with all three of my babies every day that fills me with such joy! I love seeing them learn and play together! What a blessing! This week the girls have some testing to take care of…..and we are going to be working at really getting our daily plan figured out. I think we’re close on this one so it shouldn’t be too difficult to get done. I like it when our day has fluidity and we all know what’s expected of us and “what comes next”. Here is our menu plan for the week. In case anyone’s interested in the recipes, I’ve included a link so that you can see where I got my inspiration from. That’s about it for us folks! Hope you all have a fabulous week!! !